Gdansk - Town of Memory and Freedom is part of the Tentative list of Poland in order to qualify for inclusion in the World Heritage List. When I told my colleagues that I was going to Gdansk for a long weekend, the conversation quickly veered off to Lech Walesa. We hadn’t heard from him in a long time. Had he died already? A quick Wikipedia search turned out he is alive and kicking, working the lucrative lecture circuit in the USA. His hometown is on Poland’s Tentative List under the label of Town of Memory and Freedom. Reminders to various periods in Gdansk’s history, starting from the Hanseatic era, are brought together under this flag. During my stay I mainly focused on the part called the Gdańsk Shipyard associated with the emergence of Solidarity movement, together with the Monument to the Fallen Shipyard Workers. To get to know that area and hear more about this period plus its current impact, I joined one of the daily “free” Solidarity walking tours. It’s a popular tour, over 30 people showed up from all over Scandinavia, Russia and Western Europe. We did not tour the old town which resembles Amsterdam without the canals. We explored its edges. We stopped for example at an unsightly parking lot, in front of the police station. It was here in 1970 that for the first time Lech Walesa's name appeared in the books after a demonstration. The guided walk puts places into the spotlight that on your own you would just pass by. We saw the first nightclub where rock music was played, a statue of a Polish king who beat the Turks and the former communist era dollar shop Pewex. The guide portrayed that the inhabitants of Gdansk always were a rebellious lot, and especially resented the Soviet influence. Apparently there’s quite a Gdansk versus Warsaw animosity too. Fiercely Catholic they are as well. We made a quick stop at the Brigitta Church, which served as a parish church for the shipyard workers. Over the last 17 years, people have been saving for an altar made of expensive amber - since last December it is completely finished. In front of the church is a statue of Pope John Paul II, who is perceived as the symbol of the resistance of the Catholic Church to communism. - A large memorial in memory of the victims of a bloody police action in 1970, after a strike by the shipyard workers against a sudden increase in food prices. - The entrance gate to shipyard number 2, a more informal monument. It is a reconstruction of the fence that was destroyed by a tank in 1981. In the kiosk next to it you can buy souvenirs such as lighters and mugs with the Solidarity logo. - The European Solidarity Center. It is designed in a brutalist style, it looks like a rusty ship in the yard. They hold exhibitions about the struggle for freedom in Europe, and apparently Walesa still has an office here. - The former training center of the shipyard workers, possibly the greatest tribute to the history of Solidarity. There is a photo exhibition, and a model where you can see how the yard looked like at the time of the protests. The story ends here with the round table conference and free elections in 1989. 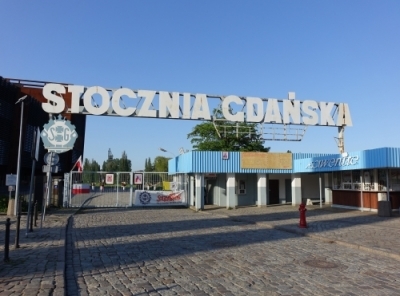 Despite its undeniable role in European history, Gdansk probably will never become a WHS. It has received a rejection advice twice from ICOMOS. The last time it was because the nomination focused too much on the intangible values. I agree with some of the other reviewers though that this is a much more interesting and exquisitely restored Hanseatic city than similar sites that have been made a WHS in the past. Gdansk (or Danzig as it’s named in German) is your typical Baltic Sea hanseatic trading town in the mould of Wismar, Lübeck or Riga. The unfortunate distinction Gdansk has is that it suffered heavily at the end of World War 2. The Poles made great efforts rebuilding the city, but as soon as you venture a bit off the city core the gaps are noticeable and the quality of the buildings deteriorates. The town is quite popular with tourists. Baltic Sea cruises will stop here for day trips. Even on a rainy and cold April evening the town was rather crowded. As pointed out by Bojana getting a restaurant table can be quite a challenge. A bit North of the city center are the shipyards where the Solidarnosc movement started and the first cracks in the communist system started to show. You can visit a few of the historical places and a museum to get a grasp of what simple workers were able to achieve by means of peaceful protest and strikes. Looking at the history of the site with Unesco it feels like Poland already decided to make it a former tentative site, but never handed in the paperwork. If you get a negative review the first time and then ask not to be examined the second time, inscription chances look very slim. I do agree with Ian that the subject of Baltic Sea hanseatic trading town is already well covered by sites such as Lübeck, Wismar, Stralsund in Germany, Riga in Latvia or Torun in Poland itself. While today these sites span three countries and nationalities in medieval time there was a very strong German influence in all of them making them even more similar. This applies also to Gdansk. The Poles have to be commended for the great efforts put into rebuilding the city of Gdansk, but this aspect is already well covered by Warsaw. Still, I do see an inscription chance. If the inscription were focused on the Solidarnosc movement and the peaceful resistance to communism, I would be fully in favor of inscription. It's hard not to sense history when you stand at the gates of the shipyard with the Solidarnosc flag tagged onto it. Gdansk has an international airport that is served by multiple low cost carriers, e.g. from Hamburg. Getting from the airport to the city was a bit of a pain though due to heavy traffic. Gdansk is also well connected to the rest of Poland by train and bus. Malbork is connected by train as is Torun. You probably also can travel along the coast to get to Stralsund in Germany. I ventured east via Elblag to Augustow. Gdansk is a wonderful city, in which I would like to live, especially along the river, between the crane and the nicely renovated medieval city center. Even with the cold weather (down to -13), the best locals (pubs and clubs) are always full and it's hard to get a table if you did not book before. People from all parts of northern Europe: Germans, Norwegians, Swedes and Finns visit this city. Good beer or vodka cost only 2 euros on average. Well I guess Gdansk's WHS aspirations are the victim of other sites success. I doubt this will get a place on the list, not because it is undeserving, but mostly because others have beat it to it. 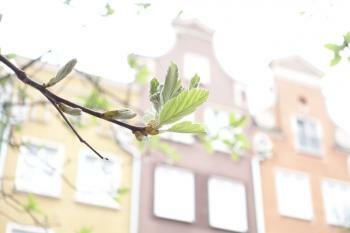 Warsaw already has its listing for its near total rebuilding after the Second World War, so Gdansk dips out there. There are plenty of Baltic trading cities already inscribed so Gdansk won't bring anything new to the table there. 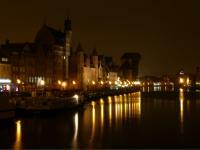 It is a shame that Gdansk probably won't get a place of the elite list as it really is a very impressive city. The rebuilding of the city centre is very thorough. I found walking around it is much more impressive than some of the already inscribed similar sites (Lübeck for example). Not only is it a city of distinct vintage it also has a wealth of modern history, from its role in the start of WWII through to the heroic actions of the Solidarity unions at the shipyards, which were played an immense part in the collapse of communism in Poland and beyond. It is also a city with a lovely atmosphere, I really enjoyed wandering around, hopping between bars and restaurants. I would certainly recommend a trip to Gdansk. It may not be a tick off the World Heritage List, however it is yet another charming European city where whiling away time strolling the streets and sampling the local delicacies was extremely rewarding.